Spring is here, the weather is getting warm, and before long it will be summer. If you want to work on your beach body but don't want to deal with the hassle and expense of going to the gym, a home gym in the basement is the ideal solution! 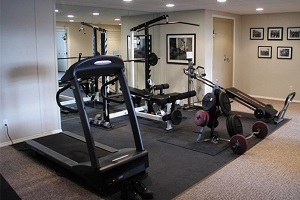 Total Basement Finishing provides custom home gym design and installation. Whether you want to use a section of your basement or turn the entire space into your personal workout area, we can provide you with the right walls, floors, and lighting for a comfortable and practical space. Flooring: A floor that's comfortable to move around on, strong enough to support equipment, and sturdy enough to not be damaged when something is dropped is essential in a home gym. Mirrors: Adding full wall mirrors is popular because it makes the room feel bigger, creates more light, and allows you to check your technique. Electronics: Adding a speaker system allows you to play the right music for your workout, while a TV in front of the treadmill is a popular way to help pass the time. If you're interested in turning your basement into a home gym, check out our design ideas on Pinterest to help plan the best features for your home. 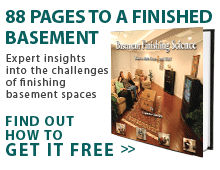 Your local Total Basement Finishing dealer will be able to provide you with everything you need to make your vision a reality. All our basement finishing products are completely resistant to water and mold damage, ensuring that your investment will be protect no matter what happens. Contact your local TBF dealer today to get started on turning your basement into the home gym you've always wanted.